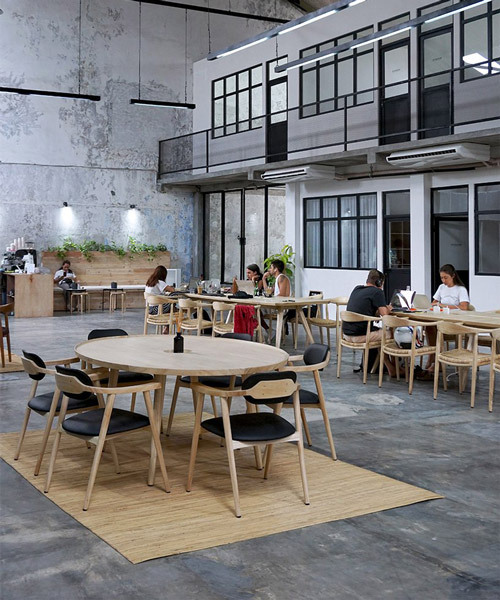 the project creates a new working environment that embraces the industrial aesthetics of the existing factory building. 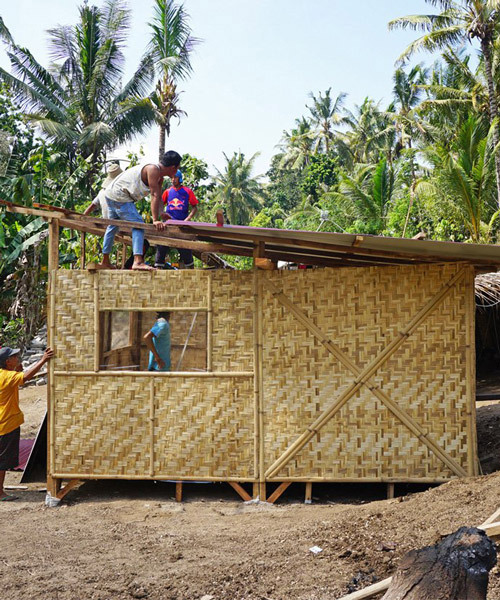 built under the guidance of bali-based architect jasmine mariani, the shelters use natural materials, include a water catchment system, electrical fittings, and can be built in 4 days. the resulting design values affordability and compactness by integrating well thought-out spaces and storage systems. here, the door can be a window, a table, or keep its initial function. design details include chopsticks made from recycled plastic bottle tops and plates made with broken beer bottles. after an intensive 11-day workshop, designboom graduates from the august course of Bamboo U in the heart of bali. the non-profit organization has used the traditional material for economic and environmental reasons, but also due to its flexible nature. after the creation of the Green School in 2008, its creators open the doors to Bamboo U sharing their knowledge and love of the bamboo lifestyle with the world. the residence overlooks a dense forest and a river below, and features large amounts of greenery that allow it to become with the landscape. 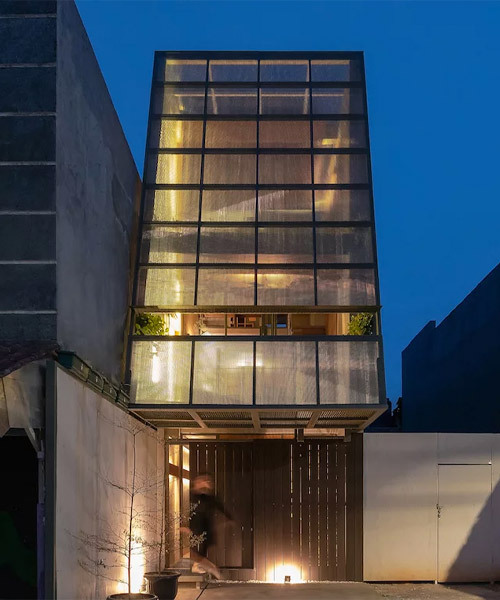 the concrete cantilever focuses the vista and landscape of the south side area, which is the kramat raya street to tugu tani street and the capital city’s landmark monas. in the heart of ubud's wellness revolution sits a cooking school that immerses guests at the four seasons into the environmental, cultural, and culinary sphere of bali. the two-story building is in an earthly tone color to blend the inside with the outside. 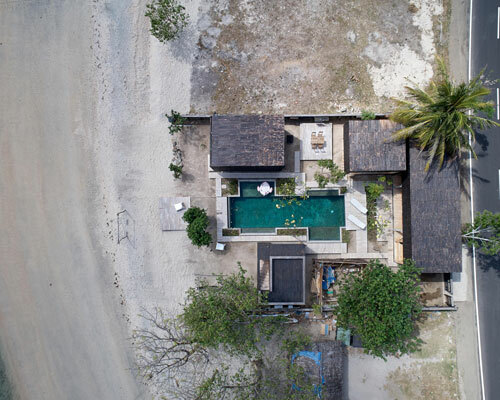 the concept of 'growing house' is very common in indonesia — the young couples and families which are not able to afford the redevelopment divide the process into several stages and continue the construction as the money come in. aaksen responsible architecture filled the family home with sunlight by maximizing the number of openings and using the lightest materials possible. 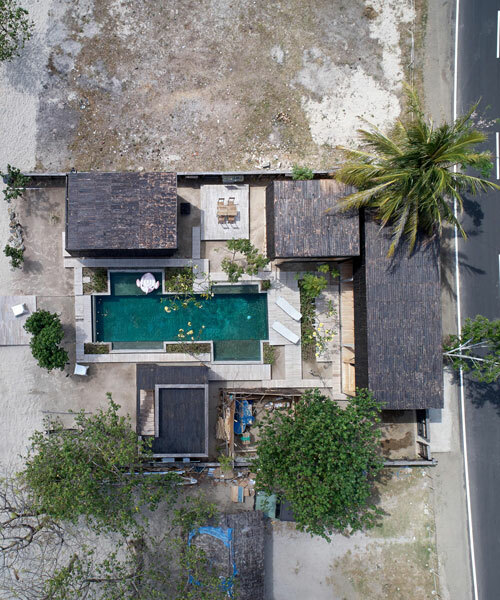 a tropical beach home blending contemporary design with the local craftsmanship is nestled in the heart of Berawa, Bali. the building’s four main wings are connected by ‘squares’ or ‘piazzas,’ which create localized meeting points and foster the sense of community activity. 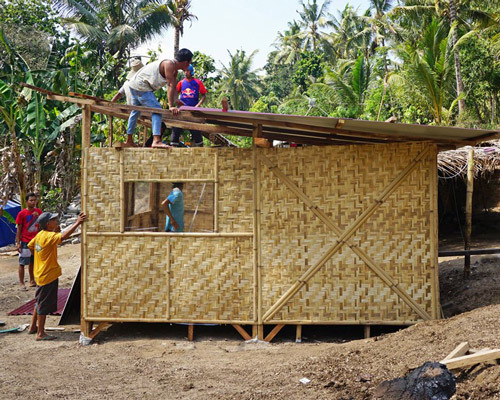 the project is built as a sustainable and green piece of architecture, collecting locally-available materials such as natural clay and bamboo. 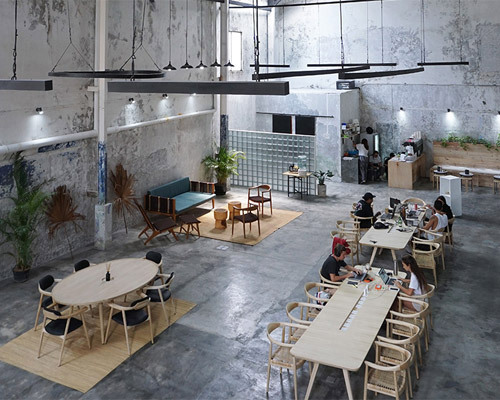 the interior concept is the transformation of a dialogue between east and west, and most of the furniture use the recycled material of early 40’s during the occupation of the dutch period in indonesia with the modern interpretation. music and rhythm were the main concepts that drove the organization of the scheme, with the higher and lower volumes symbolic to the movement of a conductor’s hand. being the first of its kind in indonesia, the project hopes to highlight bamboo as a promising material for public facilities within cities. the project is titled 'tsubomi villas', a name that translates to mean 'flower bud', a form showcased in the hyperbolic paraboloid roof canopy. minimizing material use was one of the main aims to design the alchemy restaurant in ubud - defined by its multi-leveled exterior that is opened to its tropical surroundings. defined by its dynamic roof canopy, the club's main building acts as a spine for spectators alongside two red clay courts - one of which are sunken. 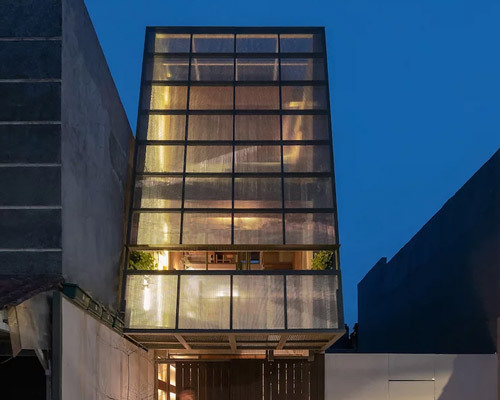 located in a gated residential area in jakarta, the outer framework leans 70 degrees from the ground to create the distinctive three-storey contemporary dwelling. the architectural concept aimed for the shelter to make its location more meaningful by highlighting the specificity of the place, in this case, the mountains around. composed of various cantilevered A-frames, the sequence of volumes separate and give character to the rustic dwelling.